Back in the 1950's, when I worked for Agricultural Extension Service, I took a course in Agricultural Journalism that introduced me to feature writing and the idea of cultivating serendipity. For those of you who don't know the story behind that word, "serendipity" is based on the adventures of the three Princes of Serendip. During their travels, they developed a facility for discovering, by chance, or by sagacity, valuable things and ideas for which they weren't really searching. Although they may have been searching for something else, when they stumbled across something worthwhile, they always recognized it. Serendipity often happens to me when I'm wandering around in adjoining states, looking for one thing and finding another. Last week, we traveled to Roswell, Georgia looking for the elusive pitcher plant for a book of poetry about plants that I'm writing and for which my friend, Victoria Sullivan, is taking photographs of plants. We had read that the pitcher plant was alive and doing well in the Chattahoochee Nature Center in Roswell, so we set out for this town north of Atlanta to find a plant that grows in wetland areas and that we more often find thriving along the Gulf coast. The Chattahoochee Nature Center began its activities in the 1970's, and during the past five years, the Center has partnered with other organizations in the rescue, propagation, and re-introduction of threatened and endangered native plants. The 127 acres of native plants and gardens also include 50 species of injured, non-releasable wildlife. We arrived at the Center an hour before it opened and sat on dew-damp benches beside the entrance, enjoying the sight of skippers having breakfast in the Joe Pye Weed nearby and hoping the summer humidity of Georgia wouldn't spoil our walk along the Wetland Trail to find the Pitcher Plant. The garden on this trail represents five types of wetlands in Georgia that stretch from the Blue Ridge Mountains to the Atlantic Ocean. At 10 sharp, we joined a groundswell of children entering the headquarters of the Center, and ten minutes later, we had begun to wander the Wetlands Trail. We hadn't walked far before we spotted the plant that also grows in boggy areas of the Gulf Coast states. 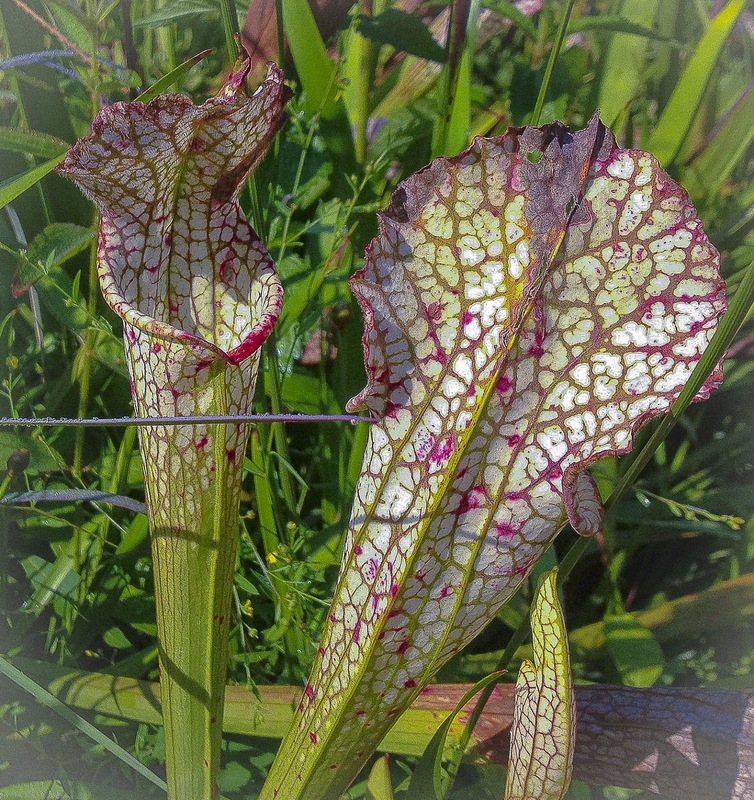 Although the Pitcher Plant seemed to be asleep in a sun that was climbing higher by the moment, Vickie took some wonderful shots of the colorful, funnel-shaped leaves with the reddish veins that attract and trap visiting insects. I told my botanist friend that the pitchers resembled peppermint candy, and she informed me that the plants probably looked that way to insects and that the nectar was the attraction. These leaves become the insects' downfall as they slip and fall into the liquid within that is laced with digestive enzymes. Downward pointing hairs prevent the insects from escaping up the slippery walls inside the attractive pitcher. We walked several other trails that included the Watershed Trail where animals make their homes and the Forest Trail through upland oak-hickory woods before we returned to the air-conditioned Nature Center to purchase a souvenir shirt and another book to add to a burgeoning plants library. Lunchtime brought us to the point of serendipity. 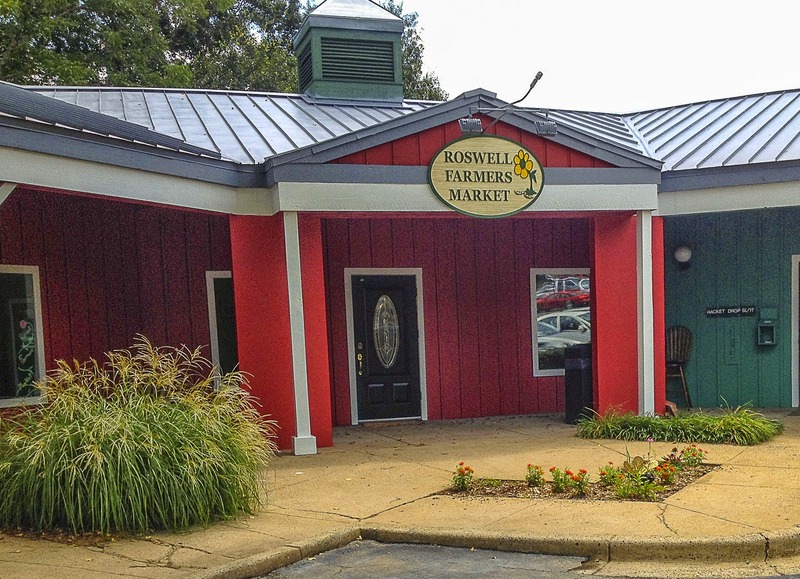 In a small mall, we located a cafe within Roswell Farmers Market that we had discovered on YELP. Inside, we approached a woman with a kerchief around her hair and announced to her that we were ravenously hungry. It was only 11:30 a.m., but we had worked up an appetite during the walk on the Center's trails. She looked surprised but promised us lunch within fifteen minutes. Thirty minutes later, Vickie was devouring a special shrimp dish and a salad. Because I'm allergic to shellfish, the owner and chef, Shannon Gowland, had (spontaneously) created a dish for me that contained ground grass-fed beef, tiny cubed sweet potatoes, purple top turnip roots, and Tioga beets, accompanied by mashed gold potatoes mixed with raw milk cheddar. The salad contained mixed greens, shredded zucchini, celery, and pumpkin seed, topped with a soy vinegar dressing that was the chef's specialty and which she offered to bottle for us. 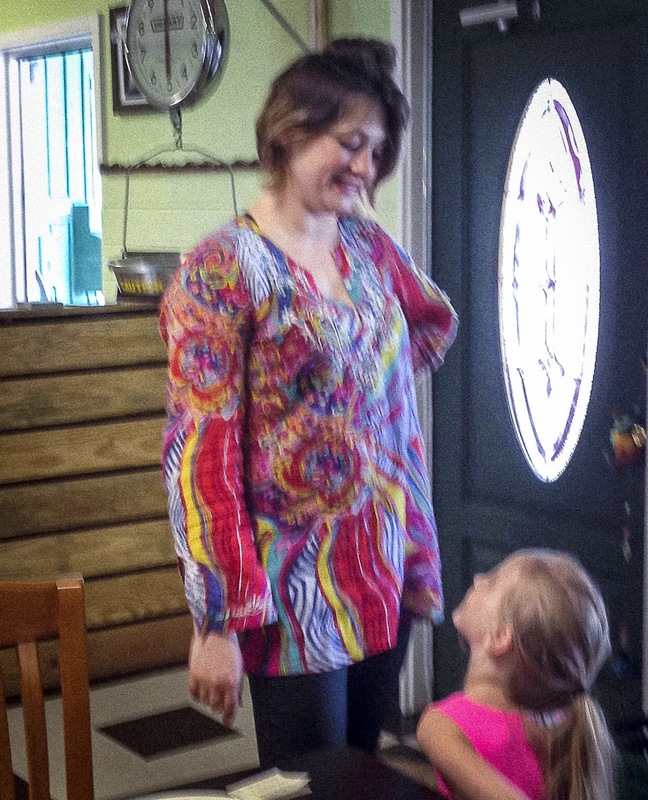 The authentic Serendip was the chef—Shannon—who owns the Farmers Market grocery (no GMO foods) and Cafe, a herbal clinic, and deals in Weight Loss and Meal Consultations. Born and raised on what she called a "biodynamic farm" near Marietta, Georgia, Shannon often helped her grandfather gather plants to make medicinals and grew up with a healthy respect for food. She worked as a dietician for pre-op and post-op patients in a Georgia hospital before establishing a herbal business, then opened the Roswell Farmers Market last year. She touts 100% grass-fed beef, organic, biodynamic, vegan, and gluten free food, and she knows how to concoct delicious dishes that have all these ingredients without offending diners by serving food that sounds like it may be medicine. We spent two hours with Shannon and her staff, and with a son and a daughter she plans to home school next year. Conversation centered on plants, and when we stopped talking and opened the door to leave, Vickie casually mentioned her book Why Water Plants Don't Drown. I encouraged her to bring in the copy she had put in her briefcase to show at the Nature Center, and Shannon bought it on the spot. We left her turning the pages with the enthusiasm of a genuine plant lover. She also offered to sponsor a meal/reading for us any time we had business in Georgia, saying that she could whip up an event with an enthusiastic audience on short notice. We added that ability to a list of her obvious talents. As I wrote when I began this blog, it's important to cultivate serendipity... especially when you travel in Georgia, which is fast becoming one of my favorite states! Bookstores and readings are common venues for book sales, but Friday I enjoyed a different kind of marketing event. I sold books at a bazaar hosted by the Monteagle Sunday School Assembly Women's Association in Monteagle, Tennessee, just down the road from Sewanee. It was a "dark and rainy" morning when the sale opened at 9 a.m, The event was slated to close at 4 p.m., but my personal fortitude waned after standing by a table hawking books, from set-up time at 7 a.m. until 3:30 p.m., when I threw in the towel and helped pack boxes of books. Rain pelted us as we exited the bazaar and headed for dry quarters. The bazaar featured everything from arts and crafts to clothing and baked goods. When we first entered the auditorium, I was intimidated by the long tables of goods since Border Press had only a small card table and copies of five book titles arranged on it, with photographs of the book covers of Porch Posts and Why Water Plants Don't Drown (Pinyon Publishing) in the foreground of the display. I was further intimidated by a craftswoman next to our table who had a large, dazzling display of silver jewelry created from old forks, spoons, and other silver items that took her at least an hour to set up on a table twice the size of ours. "Are there many book sellers at these bazaars?" I asked the craftswoman. She looked at me, gave our table a cursory glance, and said, "There's at least one of those at every crafts show I go to." She returned to arranging her table. "Do they sell many?" I persisted. "A few," she said dismissively. She was a native Tennessean from Tracy City, so I was accustomed to such brief conversations, but the dismissal didn't inspire confidence. "Been to many of these crafts shows?" My interruptions seemed to be a bit much for her, but she threw a long reply over her shoulder, "I go to three or four of these every week. I fill my van with the jewelry, take it to the show and unload it, find a campground, take out the seat in the back of the van, unroll a sleeping bag, and I'm good for the night." She beamed a smile, pleased with her resourcefulness. The last piece of information silenced me. I thought to myself, this gal ain't camping out in a van to sell a few books... and I sent out for food fortifications. I met visitors to the bazaar from Tennessee, Alabama, Georgia, South Carolina, and Virginia, and the first half of the day passed quickly because we received and talked with a lot of lookers. I spent several hours touting the virtues of porches and plants, but most people were more interested in the conversation than the books. After lunch, time lagged, and although my neighbor, the jewelry maker, stayed until the bitter end, we left at 3:30 p.m., having sold a dozen books and a few packets of cards. The cards featured the beautiful plant paintings of Susan Elliott who had illustrated Why Water Plants Don't Drown by Victoria Sullivan, owner of Border Press, and the arresting pictures attracted many lookers. Although the sale seemed to last as long as a church meeting "singing all day and eating on the ground," it was a colorful event that benefits the work of the Monteagle Sunday School Assembly Women's Association, which has sponsored the bazaar and Tour of Homes for 51 years. Following lunch, Ralph Null, renowned floral designer, demonstrated his secrets for easy floral arrangements and auctioned these arrangements at the end of the program. 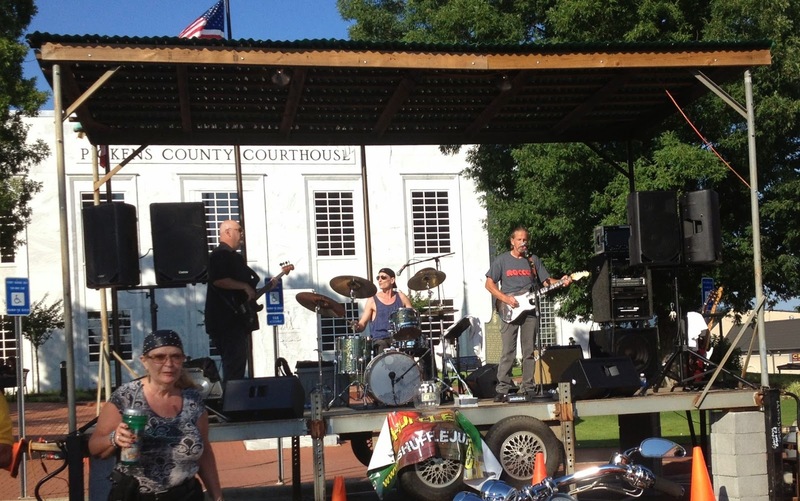 Proceeds benefitted the Monteagle Women's Association. 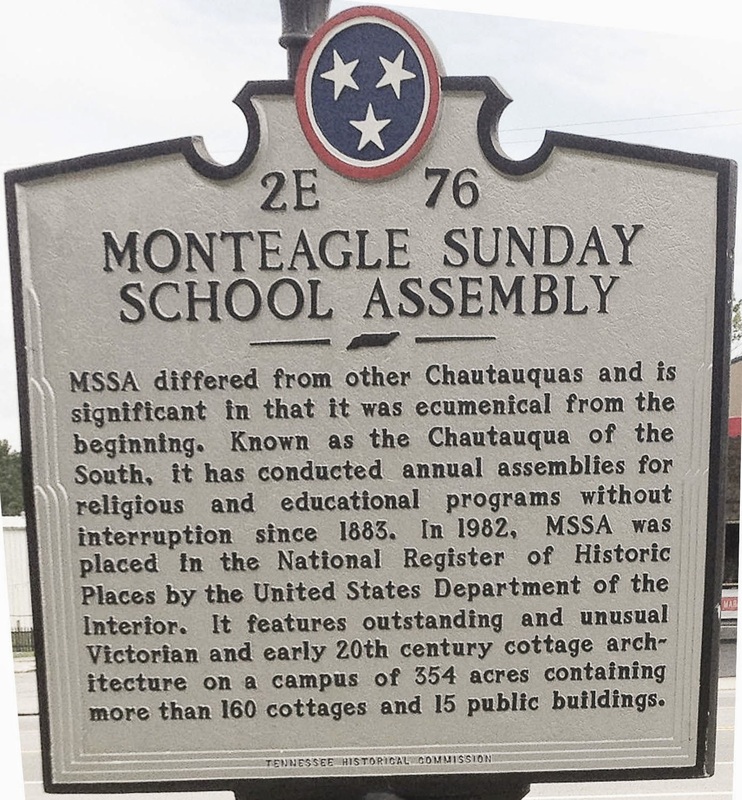 The Monteagle Sunday School Assembly has a history dating back to 1882 when the Sunday School Convention of Tennessee established an educational congress for Sunday School teachers. Sunday School teachers from many southern states attended summer classes at the Assembly in Monteagle to enrich their Sunday School teaching. 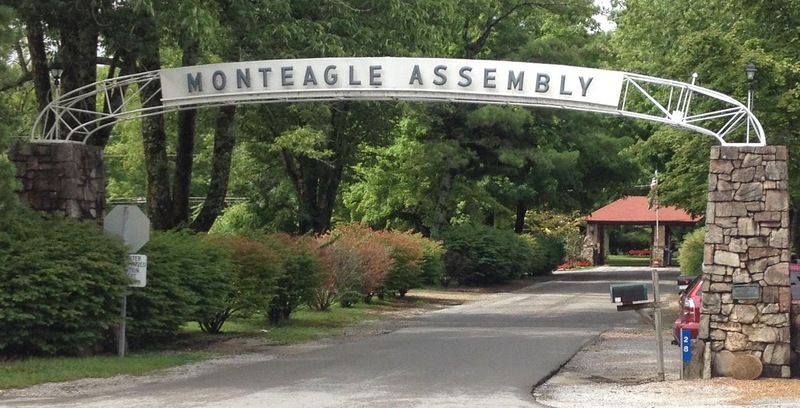 The Monteagle Assembly had close ties with the first Assembly in Lake Chautauqua, New York, which was created to combine Sunday School teaching with "the promotion of the broadest popular culture in the interest of Christianity without regard to sect or denomination," and the organization attains its mission through a variety of spiritual, health, cultural, and educational activities. The Monteagle Assembly eventually became the headquarters for the Chautauqua Literary and Scientific Circle. "The Assembly," as Sewaneeans refer to the attractive property, also contains over 160 homes, and the homeowners are fifth-and sixth-generation Assembly families. Two of the homes on tour Friday were the "Hallelujah Cottage" built in 1905, which has always been owned by women, and "Mojo," formerly known as "The Little House," built in 1885, that also has a special arrangement for dogs to come in through the screen porch door and leave through the kitchen door. Many of the homes have porches that reflect Queen Anne and Gothic architectural influences, which interested me because I've just published a book about porches and porch sitters. The homes are sought after as rentals during the summer months when special activities for adults and children are offered—youth programs dominate the Assembly's schedules. The Assembly has an active rental program, public meeting rooms, a dining hall, tennis courts, an amphitheater, and other buildings and programs designed to accommodate thousands of visitors every summer. Sunday services and evening prayer (called Twilight Prayer) take place every week, and outstanding guest ministers and lecturers are featured in programs offered to the public. We actually developed good rapport with the silver jewelry craftswoman who was our neighbor at the bazaar and shared part of our lunch with her. She told us that she makes a better living creating and selling jewelry than she did managing a convenience store and gets more satisfaction from a creative occupation. In her spare time, she paints. She's representative of the numerous, talented craftspeople and artists born and bred in the Cumberland country, and I admire her ingenuity. But I'm still not going on the road and sleep in a van in order to market my "creations." Perhaps I would've been game for this sleeping arrangement at age 40, but that number is getting ready to double! "If you've ever suffered from insomnia or if you're a person who composes nocturnes of any kind during the night hours, Diane Marquart Moore's Night Offices, her nineteenth book of poetry, will "speak to your condition." Moore explores the uses of and the cures for insomnia, famous characters who have suffered from this malady; e.g., W.C. Fields, Groucho Marx, and Thomas Edison. With characteristic wit and irony, she records the sleeplessness of various family members and friends, including her own propensity to recite the night offices, writing that "in four vigils of the night you wake/with desolation for a pillow./Phantom crucifixions hover--/monsters that pull/your soul from sleep,/peer over the edge of a ceiling fan..." She confesses that no matter where she closes her eyes, "a lightship lowers its anchor in the room." 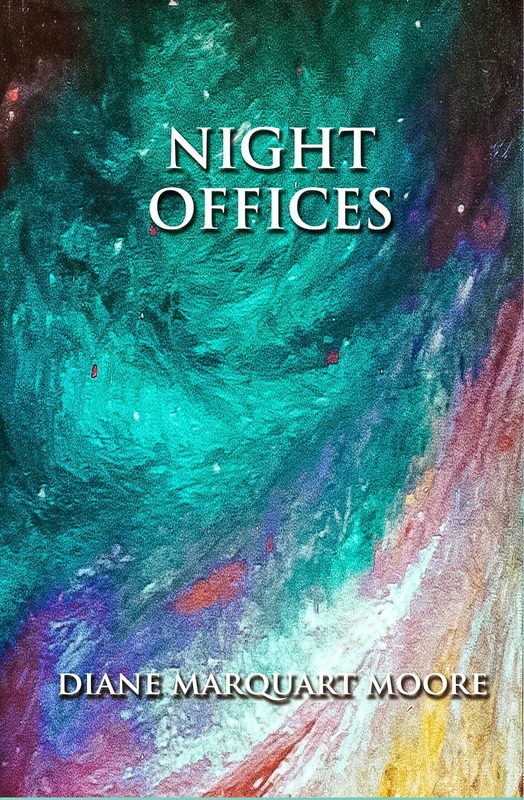 Paul Marquart, my brother in northern California, rendered the painting for the cover design of Night Offices, and Martin Romero, my grandson, designed the front and back covers. A sample of the poetry in Night Offices entitled "Opus Dei:"
Thanks again to Border Press for launching Night Offices. I might add that another book of poetry, which will contain poems about humanistic botany and photographs of plant life taken by botanist Victoria Sullivan, is in the writing stages. It's entitled Between Plants and People. 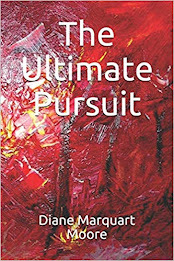 Most collections of my poetry are listed on amazon.com and on the borderpressbooks.com site. Thanks for reading! These excursions to buy peaches fresh from orchards seem to have become an obsession with me! Friends here at Sewanee gave us a tip about the best fruit in the area, and Saturday we set out for an orchard that we thought was in Tennessee but turned out to be in an adjoining state! We drove toward Winchester and veered onto Hwy. 16, which originated in the valley and led to Hwy. 79, where we began to climb, passing by granite cliffs and densely wooded areas that are characteristic of the Cumberlands. Although the highway was wide and in good condition, we had the entire road to ourselves. I began to feel we had driven onto the set of Deliverance and expected mountain men to come out of the woods to attack us at any moment. Several signs advertised the Walls of Jericho, and I wondered if we had driven into a time warp. I discovered later that the signs referred to Tennessee and Alabama trailheads that are part of the Skyline Wildlife Management area, which had once been the property of a Texas oil magnate who bought 60,000 acres of the land in Franklin County, Tennessee and Jackson County, Alabama during the 40's. The Nature Conservancy now owns 12,000 acres in Alabama and 8900 acres in Tennessee. The road seemed endless, and I thought we were on a wild goose chase when we passed from Tennessee into Alabama. We turned around and after fifteen minutes and numerous attempts, I was able to get cell service and connect with the friend who had sent us peach hunting. She revealed that she had forgotten to tell us the orchard was in Alabama. Again, we turned around and retraced our route. "We are in holy country," I told my friend Victoria who was driving. "We've passed at least three Holiness churches—the Free Holiness Church, The Holiness 79 Church, and some church with an acronym before the Holiness..."
"We can always get churched if we don't find any fruit," she said drily. I could tell that she was annoyed because even the GPS had ceased to register a speed limit for the area, which meant we were in uncharted territory. When we had reached an elevation of 1700 feet, a sign appeared at the head of a small country road. "Voila—Crow Mountain Orchards!" I exclaimed. "Your favorite bird has come to the rescue," she said. "Only 7 1/2 miles more to travel... as the crow flies." When we turned off on another lane, we began to see peach and green apple orchards and blackberry bushes growing by the roadside. We parked alongside six or seven cars and could see that the farm store didn't lack for customers—'though we wondered what highway they had traversed as no cars had passed us enroute. Inside, we found cartons of peaches, blackberries, plums, and green apples and were given a taste of the fresh fruit. After sampling the delicious fruit, we bought peaches, blackberries, and plums and departed. Bob Deutscher, the owner of Crow Mountain Orchards, was born and raised in Indiana and once had an active fruit operation there, but because he was forced to pick the fruit before it ripened in order to make a profit, he traveled south to find land suitable for an orchard so he could capture the early northern market. He purchased the 126-acre site on Crow Mountain in the early 70's and had plans to ship his fruit out in an effort to corner the northern wholesale market; however, the quality of his fruit actually brought people to his door. Today, most Crow Mountain produce is sold locally...even if goose girls like us have to get a bit lost before they locate the orchards. 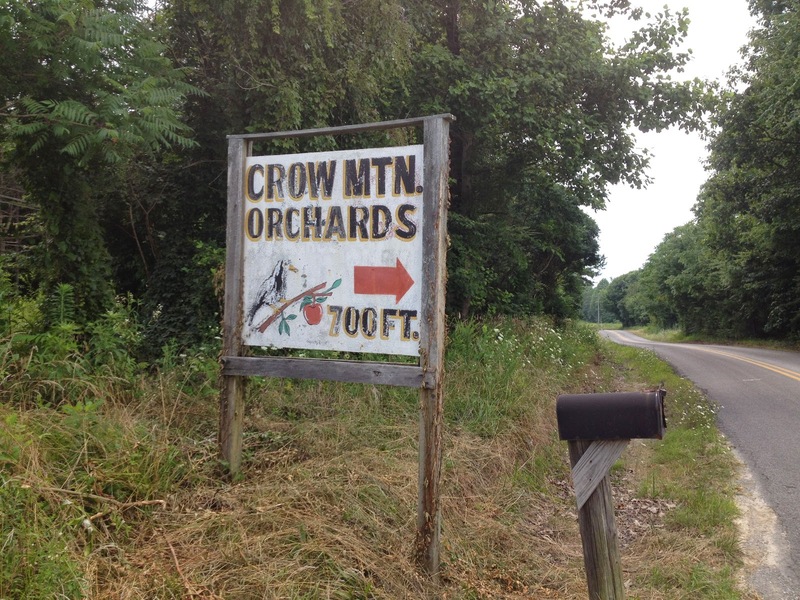 Apples from the Crow Mountain Orchards have been touted as the apples having the best color in the state and are among the tastiest, according to an Auburn horticulturist quoted on The Crow Mountain Orchards internet site. The drive home seemed shorter, and when we brought the fruit to the Hammans, our friends who had sent us into the hinterlands, they invited us to sit a spell on their porch. We ate the plums for an appetizer and were lucky enough to be invited for supper and a rock music concert via Henry's streaming device. The trip reminded me of the years I spent in Iran when expatriates had to devote an entire morning to shopping for fruit and vegetables in the bazaar, but none of the Iranians' fresh produce equaled the quality of the fruit we brought back from Crow Mountain. The Hammans, who lived in Tehran several years, agreed with me, and Kathy described how ecstatic she felt when she entered a Kroger's market and found a gleaming display of delicious fresh fruit and vegetables the year they returned to the States. Her feelings resembled my own when I discovered a bottle of Louisiana hot sauce displayed on a shelf in the Ahwaz Super Store in Iran. "Hay la bas," I exclaimed when I saw the bottle of flaming sauce in a green bottle...then burst into tears! Recently, Stuart Friebert, a poet friend who had been introduced to me through Pinyon Publishing, sent me copies of poetry translation collections in the Field Translation Series published by Oberlin College. He thought I might enjoy reading them and would be inspired to learn another language so I could translate the language of poetry from other countries. Of course, I'm too old for the latter adventure, but I enjoy reading some of Friebert's translations of German poets and am often surprised by a package of books published in the Field Translation Series that he sends to me. The most recent surprise package contained a copy of Valuable Nail, Selected Poems by the German poet, Gunter Eich, translated by Stuart Friebert, David Walker, and David Young. Friebert's interest in Gunter Eich was piqued when he traveled to Europe on an H.H. Powers Grant to meet with a number of West German poets. He became so intrigued by the poet that he made second and third visits to study Eich's ideas about the "minimum," or, as translator David Young writes: "the claim staked to shreds and remnants, to the things we begin to notice and prize when our dignity and comfort are stripped away ...especially in [the] tendency to find mysterious signs and tokens in the natural world..." Thus, the title of the book, Valuable Nail, becomes plausible to readers when it appears as a commonplace object in the poem "Inventory" and denotes the symbol for Eich's life and thought. In the introduction to Valuable Nail, David Young explains Eich's "glancing technique" where subjects brush past quickly as readers grasp issues that are at the edge of the vision and two or three words make up a small image that accounts for what Young calls "...a great chunk of terrible history..." Readers may dismiss many of the poems as trivial, but the simplicity of the imagery is comparable to the simplicity of more accessible (and not so dense) poets like our Robert Frost or Robert Francis, New Englanders who know how to create arresting visions using lyrical brevity. Readers recognize this simplicity in Eich's poem, "Days with Jays:"
grind in the early dawn. a cloth that he pulls over me. His flight is like a heartbeat. and what is his sleep like? between the folds in our skin. are resting up from the centuries. the wind continues on its way." In such concise lines, we see how small images give the reader a glimpse of this "chunk of history" to which Young alluded in the introduction to Valuable Nail. 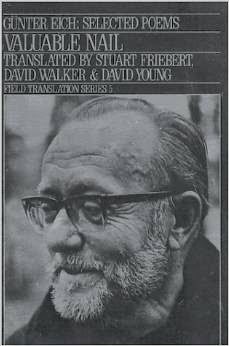 Although Stuart Friebert won't succeed in luring me into the world of translating poetry, he has certainly inspired my interest in the genre and the poets featured in the Field Translation Series, and I appreciate the introduction to these translations published by Oberlin College where Friebert taught German for years. He also founded and directed Oberlin's Creative Writing Program and co-founded Field Magazine, the Field Translation Series, and Oberlin College Press. Pinyon Publishing recently published a collection of poems by Friebert entitled Floating Heart. Due to a mix-up in reservations, a trip we had scheduled for the Mississippi Gulf coast for the 4th of July cancelled out, and we improvised for the holiday by meandering over to north Georgia. We landed in Jasper, Georgia again and made plans to search for more peaches from the orchards near Ellijay. After checking into the Woodbridge Inn the evening of the 5th, we walked to downtown Jasper, drawn by the vroom of motorcycles and a band playing on Main Street. Turns out that a Downtown Bike Show, sponsored by the American Legion, was in progress, and an array of vintage bikes were lined up in the center of the street—beautiful, gleaming bikes whose riders were also vintage, probably between the ages of 50-70 and sporting the "costume" of that era, complete with Willie Nelson headband. Of particular interest to me was a WWII, olive-green bike that Harley Davidson had built for military use during the "Great War." It had been restored and was at the head of the line of more contemporary Harleys being judged in the competition for the best looking bike. The music for this event, also vintage 60's and 70's, was billed as "jazz," but my ears registered "rock," and when the MC announced that the next event would be a contest for the loudest bike, we quickly exited the scene. People attending the festival amazed me—no one applauded the music (except us), and we were among the few attenders who went over to the bikes and examined them as if we were veteran bikers looking for a new ride. No one danced in the street; no one tippled beer from Styrofoam cups—the celebration in this culture contrasted sharply with the Cajun celebrations and fais do do events that take place in our second home, "The Berry," aka New Iberia, Louisiana. 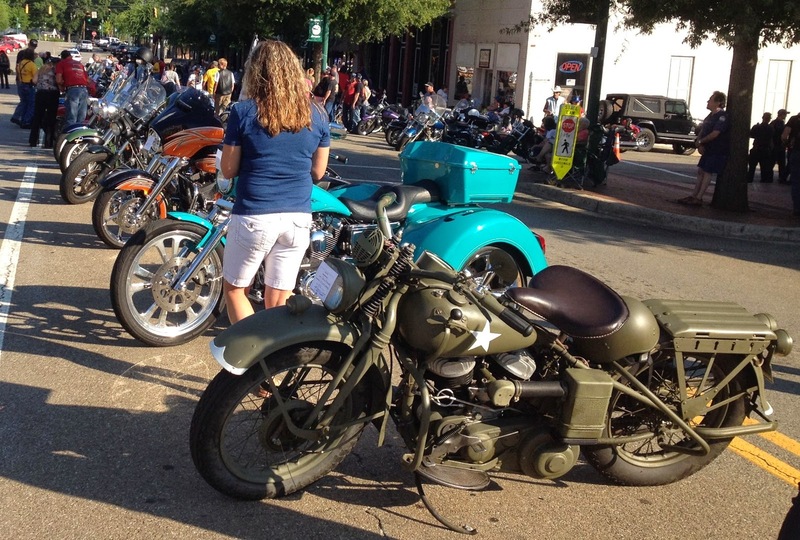 The following morning, Main Street was pristine—no trace remained of a July 4th week-end celebration featuring bikers and jivey music. The next day I went over to the Pickens County Library, an imposing building for a town of 3,600, that boasted an impressive sculpture of a boy reading to animals created by the Atlanta sculptor, William Sunderland, whose "Peace on Earth" sculpt won the People's Choice Award and is showcased in the Carter Center Garden in Atlanta. Sunderland studied under Pasquael Martin in Pietrasanta, Italy and has won many accolades for his creation in Carrara marble of sea lions nuzzling each other entitled "First Love." I spent an hour reading about the agri-tourism business of north Georgia, a subject that fascinates me every time we hunt for peach orchards and farm stores that sell the luscious fruit. According to an article in Georgia Magazine written by Jackie Kennedy, 52% of students enrolled in the University of Georgia College of Agriculture and Environmental Sciences are female, and their perspective is needed because women in Georgia are interested in farming and farm services – they want to till the land and promote the industry. North Georgia is big on agri-tourism—from orchards to vineyards—and there's a growing interest in farm fresh foods, U-pick berry farms and apple orchards. Farmers take seriously the stats about the world population growing to nine billion by 2050 and know that a variety of perspectives, including an emphasis on farm fresh food, will be needed to feed the burgeoning population. It's the time of the pause between books I've been writing—a time when I'm reviewing the work of ants, spiders, birds, plants, and the lime green trees in the wood beyond my front porch. I can't call it the time of idleness because I have a condition that is known as "racing mind," and contemplative or centering prayer is difficult for me unless I have some sort of mantra buzzing in my brain. I console myself that the transcendentalist Thoreau observed, read, listened to the sounds of nature, built a cabin, planted a garden, and wrote about all of this during his two years of communing with nature in the Concord woods. As far as I know, he didn't assume a lotus position and just ponder or practice nothingness. Right now, the crows overhead are jeering at me, as they do every time I come out on the porch. I've read that they recognize faces and voices, and we keep up a lively conversation above the sound of construction work going on near my driveway. One of them waddled over to my steps the other day and cocked his yellow eye at me when I recited the first poem I learned at age four while my mother read aloud from A Child's Garden of Verse: "A birdie with a yellow bill/hopped upon my window sill..." The crow quickly exited the yard at the sound of rhyming verse since he's more accustomed to readings of my free verse, and he flew away when I continued to recite the rhyme in a sing-song voice. Moments later, my nose picked up the scent of a skunk, a creature more equipped for nocturnal visits, and I shuddered, remembering the family that colonized the insulation underneath our cottage two years ago—and ripped it into pieces for a nesting place to raise babies. Three skunk catchers later and $1,000 poorer, we rid ourselves of the offending visitors. I hope the scent this morning doesn't indicate there's a scouting expedition nearby. We've had rain in sporadic bursts for weeks, and the snails are out. A large one was encamped by the French doors leading into our living room, and I was rude enough to interrupt his slumber, brushing him into the yard. When I was a child, a neighbor bully was fond of sprinkling salt on snail bodies when they emerged from their shells and would watch them turn into "butter," as he called it. It was a gruesome sight, and I've never bothered to find out why this chemical reaction occurred as it was a clear violation of nature. 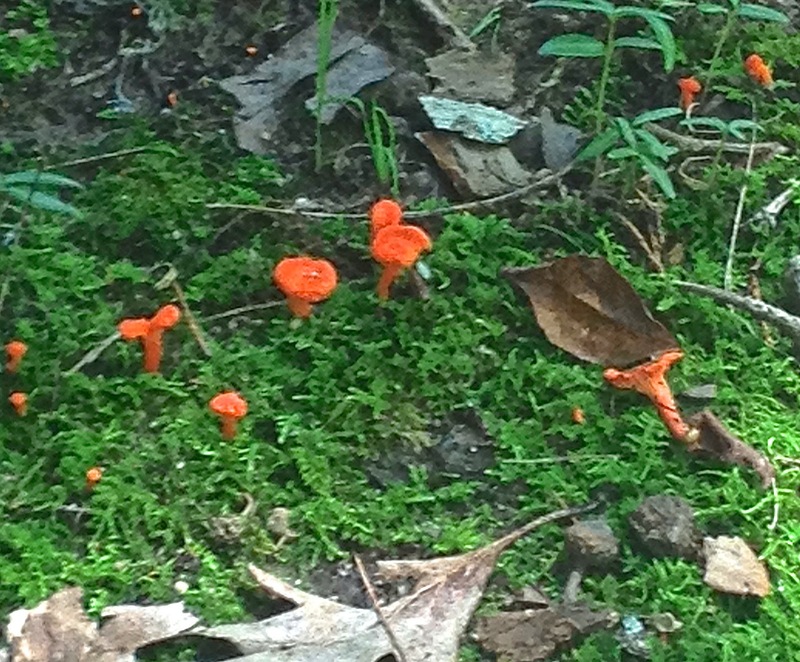 Tiny bright orange toadstools have appeared in the bed of fern, varicolored hosta, a sickly lemon balm plant, and a stunted rosebush by the steps, the latter two preferring more sunlight than they're getting under the shade of the white oaks. The toadstools look like the fairy footstools my mother painted in her renderings of fantastical creatures that she imagined populated the piney woods near Franklinton, Louisiana. I expected a gnome with a pointed hat to appear on the spot as she always painted a gnome standing alongside huge mushrooms, a palette in hand and a large green frog perched in the foreground, observing the magical creature at work. Those who want to read expert observations on the natural world should get a copy of The Unseen Forest: A Year's Watch of Nature by David Haskell, or read his blog entitled "Ramble." He has received national awards for his wonderful writings about a square meter of space in the woods where he spent a year observing nature at work. I'm not a trained naturalist, but I do like my observation post on the front porch here at Sewanee and find that it's a great way to reclaim my writing urges on a day that could have been a time for just being a good for nothing southerner doing some serious porch sitting.